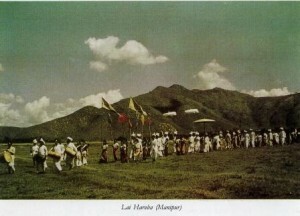 Literally Lai Haroba means ‘festival of gods’. It is inspired by a local legend and the festival, through highly symbolic rituals and dances, create and demolish the cosmos. Several forms of dances are performed during the festival that lasts from ten to fifteen days. Lai Haroba of Manipur is conducted by a special kind of priestess called maibi and priest called maiba According to the legend, nine gods brought earth from heaven. Seven goddesses took the earth from the gods and threw it on the primordial ocean. On the first day of Lai Haroba these gods and goddesses are not only invoked but they take their symbolic birth from water. Two maibis wearing spotless white costume, along with villagers, go in a procession near a stream. Taking two new and empty earthen pots the maibis get into waist deep of water. Two leaves, symbolizing the male and female principles, are put in the water, one facing upwards and the other downward. It is imagined that the seed of creation is within the two leaves. The surface of the water of the stream is gently patted to make ripples which suggest the union of the male and female principles. Then the pairs of leaves are kept in each of the two earthen pitchers which are now filled with water. The maibis take the pitchers in procession to an improvised temple. The deities and the temple are made with wood, cane, bamboo, and such other materials which can be burnt to ashes, because at the end of the festival everything is set to fire signifying the dissolution of the cosmos. The earthen pitchers are placed near the improvised temple. Symbolically the creation begins and a human being is born. Through dance movements and processions the life cycle and growth of human beings, agricultural operations etc are depicted in a stylized manner. Music for the various rituals and dances is provided by a simple stringed instrument called pena which is peculiar to the region The festival concludes by burning the temple and everything used during the festival which, as said before, signifies the dissolution of the creation.